Drawing for the Absolute Beginner: A Clear and Easy Guide to Successful Drawing is an inspiring book that makes drawing in a realistic style easier than you may think and more fun than you ever imagined! 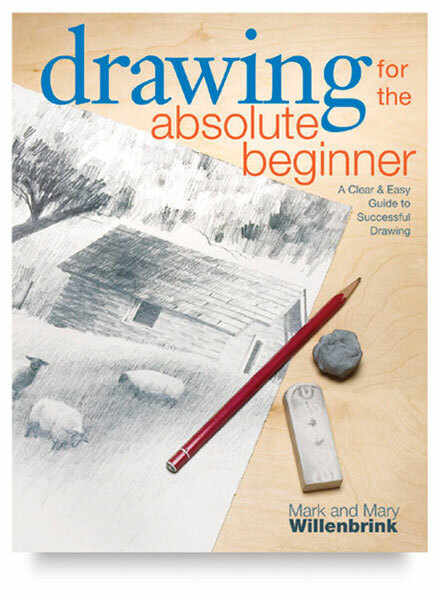 Authors Mark and Mary Willenbrink cover it all — from choosing materials and the correct way to hold your pencil, to expert advice on the tricky stuff, like getting proportions and perspective right, drawing reflections, and designing strong compositions. At the heart of this book, a series of fun, hands-on exercises help you practice and perfect your strokes — 24 mini-demos lead up to nine full step-by-step demos. Each exercise builds on the previous one as you develop your skills, build your confidence, and enjoy yourself along the way. The lessons you learn by drawing simple subjects such as coffee mugs, clouds, and trees will help you take on progressively more challenging matter like animals, still lifes, landscapes, and portraits… the kinds of subjects and scenes you've always dreamed of drawing. This book is just the ticket for budding artists of any age. It's never too early and never too late to discover the pure joy of drawing! Author — Mark and Mary Willenbrink.